SUTIABA, Nicaragua (CNS) — Father Victor Morales was awakened at 5 a.m. by the young men on the barricade outside his church. “They’re coming, father. They’re here,” they told him. What the community had been afraid of was happening. Father Morales cautiously looked down the street and saw scores of armed, hooded men flooding into Sutiaba, a suburb of the city of Leon, Nicaragua’s second largest city. On that day, July 5, the Nicaraguan police, with masked and armed paramilitary support, attacked Sutiaba. The “clean-up operation,” as the government called it, resulted in three dead among the parishioners of Father Morales’ St. Peter Church. In the month since, the community has been living in fear. Nationally the pressure on the Catholic church has also increased. Locals remain cautious about telling their story. In June people throughout Leon had put up barricades built of paving stones to protest the FSLN government of Nicaragua President Daniel Ortega for the violence against protesters since demonstrations erupted in April over reforms to the country’s social security system. The barricades also were a self-defense mechanism, to prevent paramilitaries driving into the suburbs in trucks and shooting. However, after a month of stalemate the state was forcibly going town by town and to remove the barricades down. “It was very violent that day,” Father Morales said. “They had riot-police and paramilitaries in at least 20 pickups, and bulldozers. I couldn’t leave the house for a couple of hours. I felt impotent, furious and sad. But later I could walk to the health post and I learned about the deaths. Four blocks south of the church the remains of the barricades litter the streets, and two sad crosses mark the spot when Junior Rojas and his friend Alex Machado Vazquez were killed. 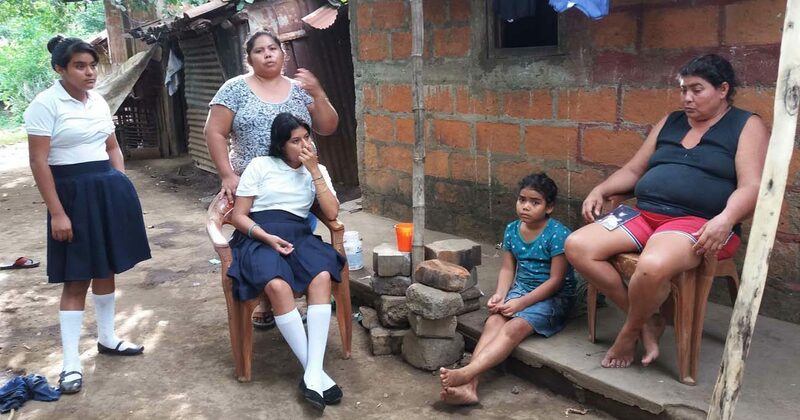 Down a dusty alley, past a large rabbit hutch, the members of Rojas’ family sit outside their two-room house, still seemingly in a state of shock. Rojas, worked as a builder’s assistant and studied at night school. “We went to get his body later that day. They would barely speak to us. There was no autopsy, no investigation, they gave us no paperwork. Only one doctor dared look at him that day. They warned us: ‘Go home to your family now, or something worse might happen there,'” she said. The young man was killed just yards from Machado, 24. Three blocks away another young man was killed under the shade of a large Tamarindo tree. Danny Ezekiel Lopez, 21, apparently was shot as he passed a barricade on a bicycle. The government’s operation moved from Leon to other towns during July, with a steady succession of unarmed young men killed by hooded paramilitaries with high-caliber weapons. Since the protests began in April at least 300 people have been killed and thousands of others have been injured in imprisoned, according to the International Human Rights Commission. Nationally, the Catholic Church has tried to keep alive dialogue between the government and the opposition, despite accusations from Ortega that the church is part of the opposition. Cardinal Leopoldo Brenes Solorzano of Managua has said in weekly mass that the church “is persecuted,” but will not give up its mediation role. Visiting Leon for the first time Aug. 2, Archbishop Waldemar Stanislaw Sommertag, apostolic nuncio, emphasized the role of the church. “The national dialogue is the only route to peace,” he said. The church received a new show of support Aug. 5. Archbishop Timothy P. Broglio of the U.S. Archdiocese for the Military Services, chairman of the U.S. Conference of Catholic Bishops’ Committee on International Justice and Peace; visited to observe and support the dialogue process.